Whether you consider yourself an artist or not, I'm sure you can relate. We've had such a limited amount of snow in the past five months. It's definitely reason to feel apprehensive about the coming months. The summer of 2015 quickly turned troubling with the lack of moisture. Before we realized it, we had a hard wildfire season. Smoke-filled haze and ash on flat surfaces was such a disappointing end to summer activities. We still need moisture in some form. Whether it be gentle rains or (typical for our spring) wet, heavy snow this time of year would be very welcome. It's easy to become discouraged when we base our hope on what we can see or understand. Human perspective is surely flawed! And I'm included. Tuesday morning I noticed garbage strewn along the ground near a dumpster in a nearby alley. That was what my eye noticed, glancing out of the corner of my eye. With my two teens in the car, we headed out for an orthodontic appointment. I was fixated on the sight for a moment - caught up in it. Does that ever happen with you? In can easily turn into a negative thought pattern. Do you notice what happens as you draw closer? Looking more intently, focused, it all changes to something so mesmerizing. The effect is much different than with a quick glance. The studio has been a busy! The flow of activity is not smooth; adaptive and flexible describes my energy. While plenty has been happening, the vintage tractor has not had any work done since last Friday. I'm feeling less focused on writing for today but I do want to share, so bear with me, please. Update 3/30/16: I've just realized perhaps I have more to share about this watercolor painting. I attempted to build a graphic last week but just wasn't happy with the results at that time. It's all working together much better today. While preparing to add the graphic at left, I noticed the photographs taken while sketching out the tractor. With a more detailed subject that needs more accuracy, I take more time to make sure the proportions are correct. In the coming weeks, I'll prepare to share how I begin a drawing and what tools & tricks help guide the process. Stay tuned! Another lightbulb moment!! I hope you enjoy reading and seeing all I bring to share here along the way. 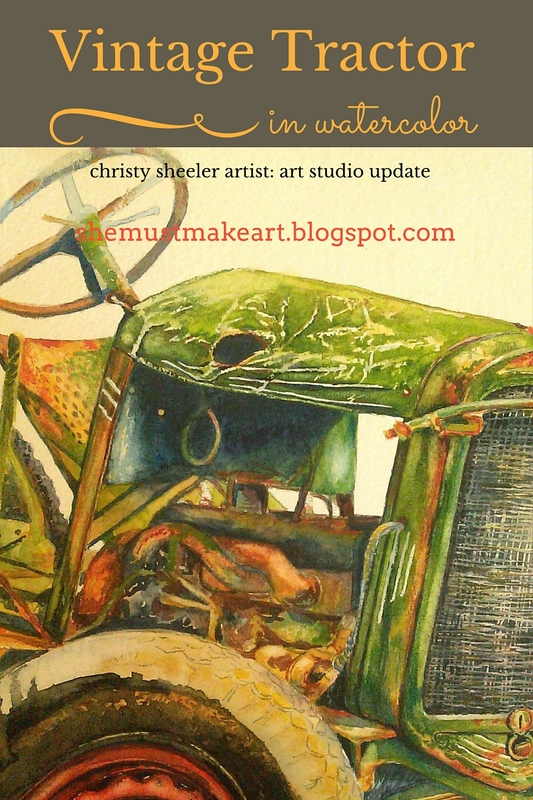 Once begun, the watercolor painting of the vintage tractor moved along quickly. Within two days, a lot of change took place. Masking fluid was used to preserve the fine lines on the radiator. I mistakenly called it a grill while talking about it previously. Silly me! I worked on it up until last Friday. Sadly, it's taking a backseat to other things for now. Even at this point in the progress of this watercolor painting, there is quite a bit of interest in this painting! I've had some questions about whether it will be available for sale when complete. Yes, it will be available to purchase! Please feel free to contact me for more information. I've been a busy girl, wanting to get it all done now, when there's not enough hours or energy to keep up! There isn't a specific to-do this for each day. That probably needs to change. I have a mental list of tasks and goals but no real game plan for each day. It feels like a bit of chaos. 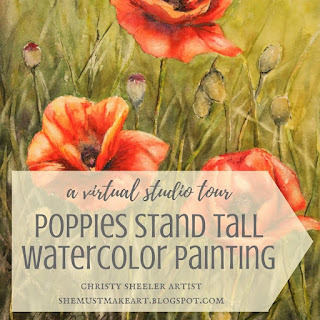 The final two poppies watercolor paintings are now listed in the ChristySheelerArtist shop on Etsy. These are the originals, 8" x 10" in size, on 300 lb. 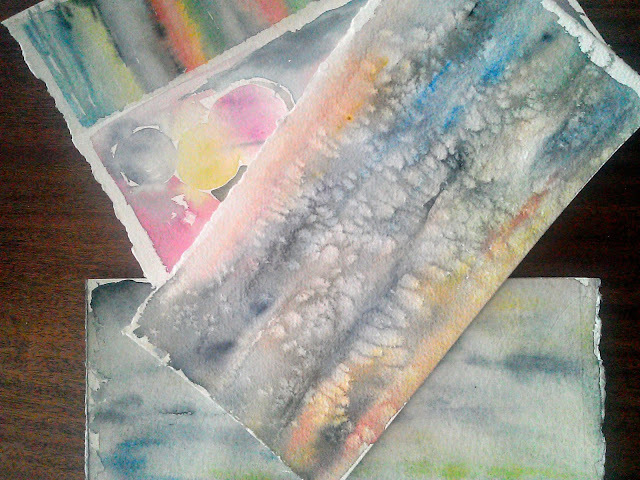 Arches cold-press watercolor paper. In the previous post, I shared Why I Make Watercolor Mixing Grids. Better than telling is showing! This quick video shows the action in completing a row of mixed swatches. Watercolor mixing is great fun!!! 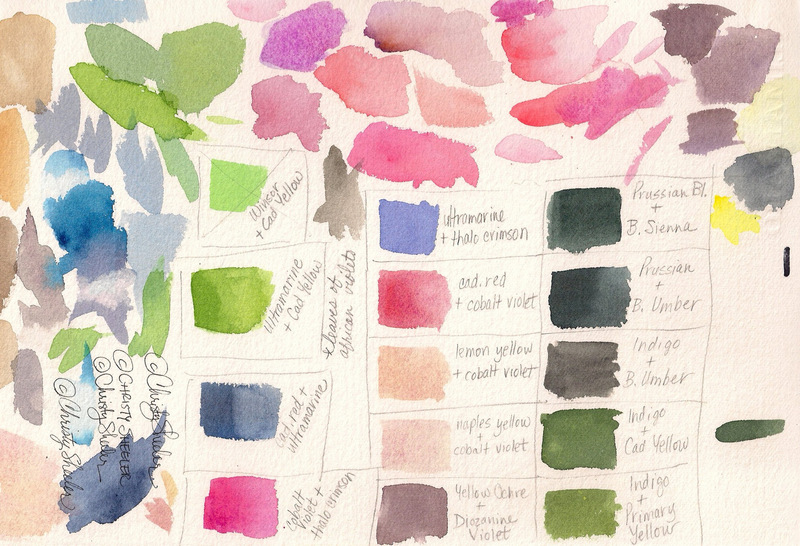 The result is a guide for an upcoming watercolor painting. Having a reference close at hand is such a great tool. I can't imagine being without some record of the general creative plan. The video is created with Magisto free version. Are you even a tiny bit curious? I hope so. It's short. It seems self-explanatory to me, but maybe not. My purpose isn't really to give a demo how-to but to a quick little glance at what I've been doing lately. If it seems too small a window, click to view on YouTube. Over the years, I've noticed that people have a fascination with watching artists at work. Whether it's other artists or myself...I know that when I pass by an artist busy with their craft, I've got to stop for a few moments and see how they do their thing. I remember in California Adventure, the amusement park, there are artists who look like street sweepers. They come along with a bucket and and a broom...and they create a work of art there on the sidewalk with water. That artwork is only there until the water evaporates. I was just amazed. I could follow them all day, watching what they'll create next!!! What do you think? 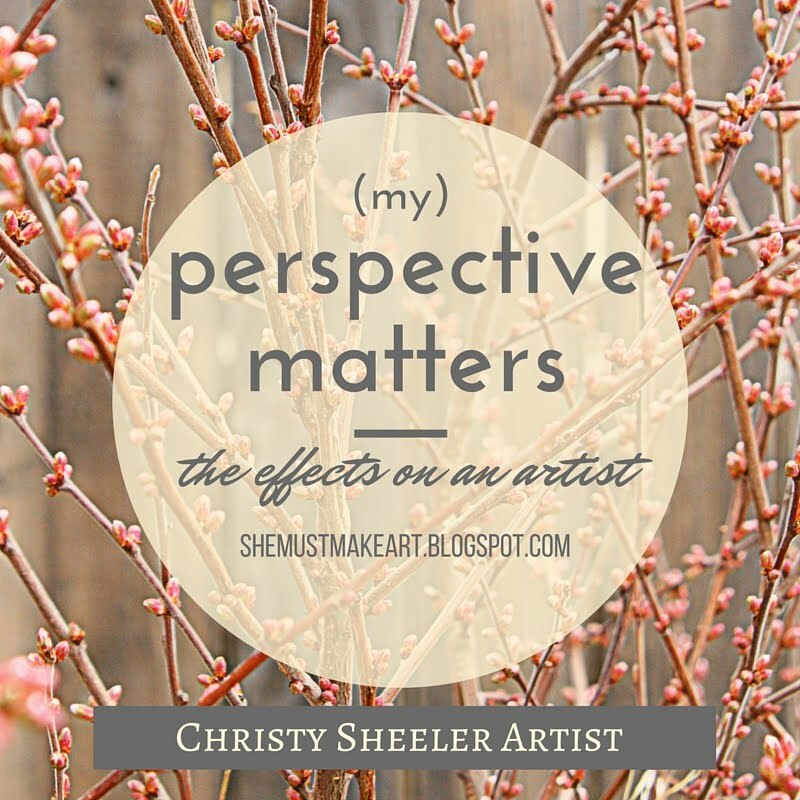 Have you ever stopped to observe an artist while they create? Have a beautiful day! Remember to watch for the priceless in today. Let me begin by saying that not every artist does it this way. Some use washes of pigment, adding in layers on top of layers...the previous one dry before another is added. 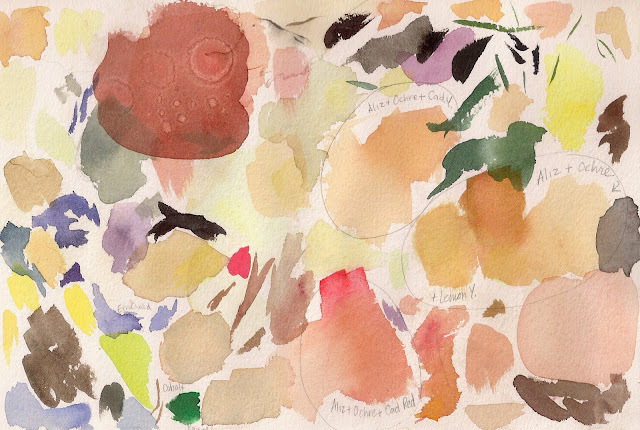 Some artists change pigments as they paint, letting one color meld into another. 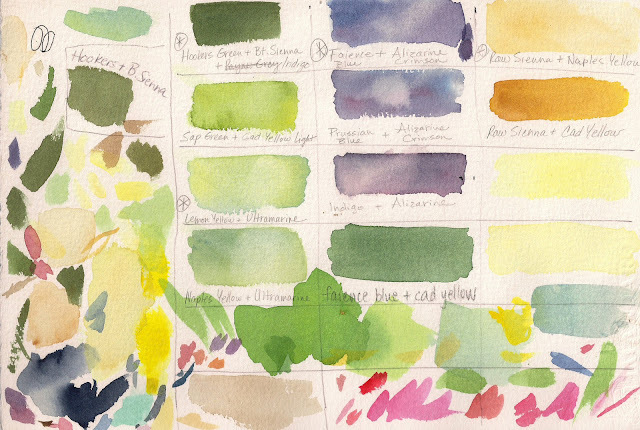 It is such a fun sight, seeing the color mix right there on the paper. And some, like me, get caught up in the possible combinations (endless?) 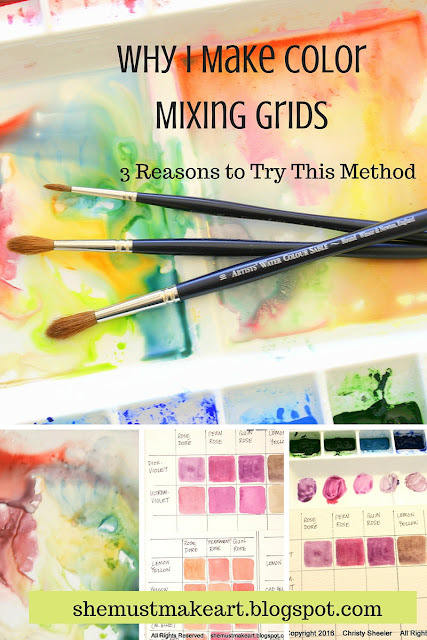 of mixing various pigments! Every artist has their methods. It's great experimentation to see the results on paper. Add to that, the ways the result can change by diluting with water, changing the proportions of pigments used, adding a third pigment. Have I lost you already? I hope not! 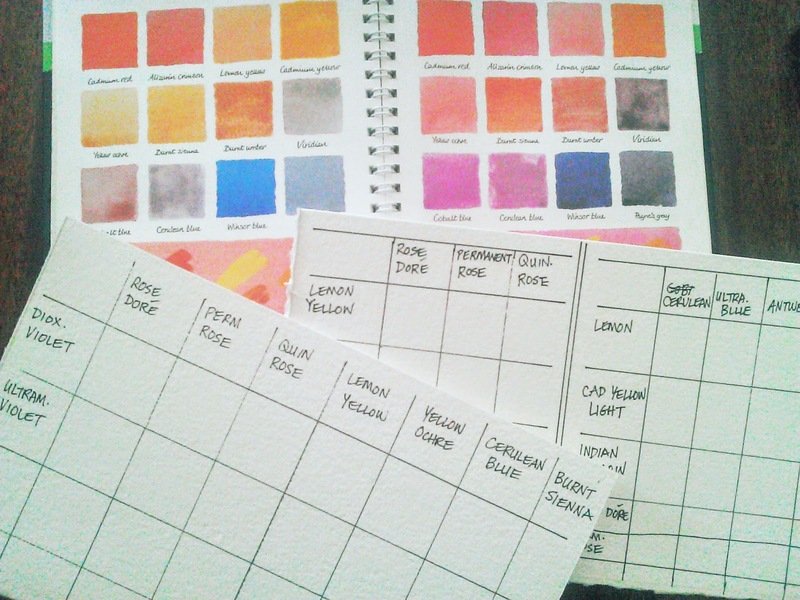 Color mixing grids have become a key part of my preparations for painting watercolors. I usually have a firm vision in mind of where I'd like to go with an art reference photo. There are times when the vision is still fuzzy and the color mixing can help me make more decisions. My mixing results do not have to match the photo. The photo is just a guide, a starting-off point...inspiration. It took me a long time to let go of the expectation to stick to the photo too closely. That may have been when my artistic style began growing in a really noticeable way. 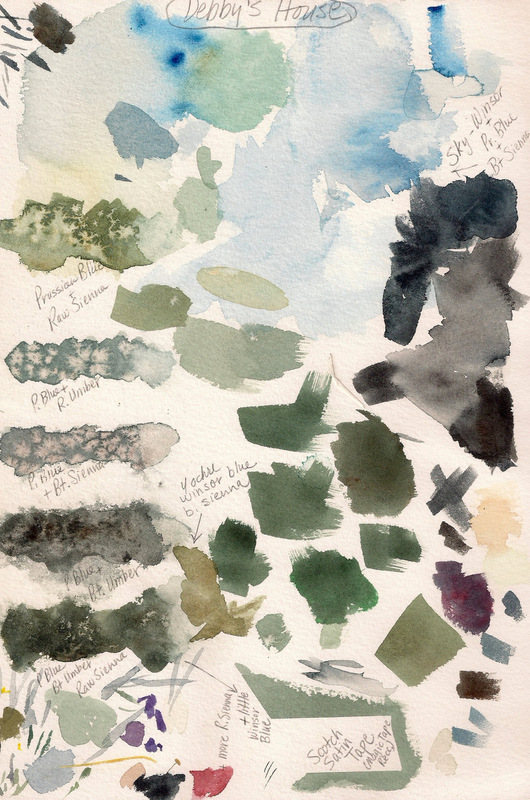 Several years ago, my way of mixing pigment was more haphazard. It was a guess-and-by-golly method! I'd pick pigments out not really knowing much about their characteristics. Is it transparent or opaque? Transparent pigment will show the layers below it. This brings a luminescence. Is it more granular...resulting in a mottled effect? Is it strongly staining? Lifting and scrubbing later, there would still remain a hint of that pigment. So here's an example of my earlier color mixing "notes" from previous paintings. They give me very little information about how I got those sample bits of color. I may look back now and love something I see there, but without any written guide, it would be hard to duplicate now. 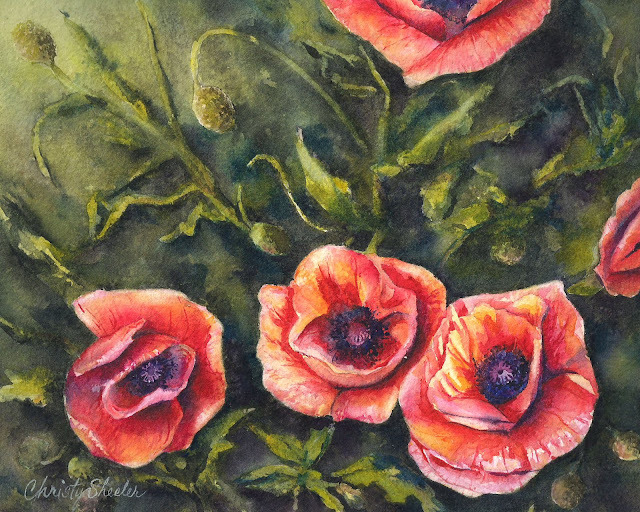 A more traditional composition of bright red poppies, orange and yellow where the sunlight touches the petals. It was just before dusk on a late summer day when I took the reference photos in a neighbor's garden. The poppy's vivid yet soft, tissue paper petals always capture my attention. Copyright 2016 Christy Sheeler Artist All Rights Reserved. In the past two weeks, there have been expectations. Big ones. I set these big expectations myself. In my impatience and frustration at not having the results that I want, I push harder. In my multitasking frenzy, I crank up my pace and get more done. It's not easy. It's tiring. I want to cross more off that mental list. There are all the tips I've read online. 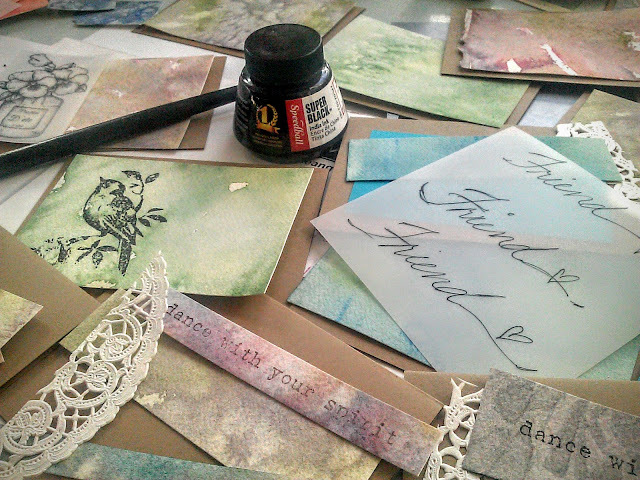 Managing social media can crowd out the creative flow and overshadow the art process. I feel my attentions going in too many directions. Something inside, like a warning signal, tells me if I continue like this, burnout is a possible result. I'm running out of steam. It's time to do things differently. 1. Slow down. Reconsider the priorities and the timeline. 2. Listen. What do we hear our bodies telling us? Are we emotionally strained? Is the body needing an easier pace? Are we taking care of ourselves? 3. Rest. We can only keep up an unreasonable pace for so long. When we drive ourselves to unreasonable limits, there will be a price to pay. 4. Reflect. Examine what's really of most importance. What is urgent? When we list our goals and rate the priority, can a few be dropped? Paying attention, evaluating and reconsidering helps us to be better at what we don't want to give up. This is the advice I've been trying to give myself. Maybe you will see the same true for yourself in the past, now, or in the future. Overworking myself, I'm taking a risk that I will lose the joy for the art. The passion for the creativity is worth protecting. The only time lines are the ones I've chosen. My back and neck have been sore for the past two weeks. I'm very tired even while trying to keep up this pace. All because I want it when I want it. Not too bright. This week, I've felt sluggish and drained. I know it's a result of all I accomplished last week. I had so many ups and downs with the tasks I was determined to finish. I learned the basics of Canva, Society6 and Photoshop Elements. 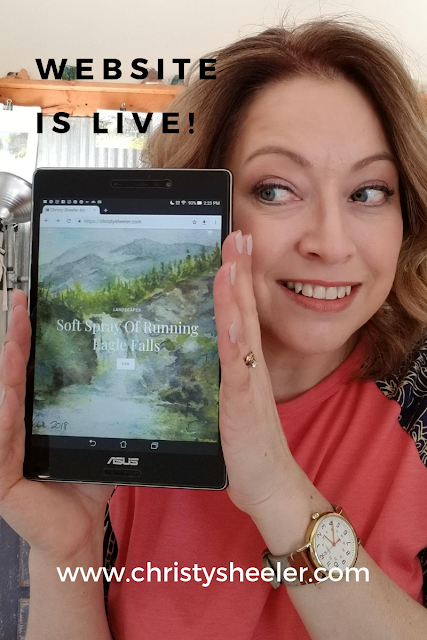 I used Canva to make a fantastic graphic for sharing on Facebook. It was a photo collage for my daughter's 15th birthday. It was easy to learn and fun to create with my own photos. It's a great option for playing around with graphics. I'll learn to use it here for giving the blog intro's more pop. Photographing new artwork for two different purposes was a big task to complete. Then, I applied with Etsy to sell prints...that took several hours to complete, still no answer there. Scanning new and previous artwork spread over into my Saturday. I've got such a desire to get so many balls rolling at once! 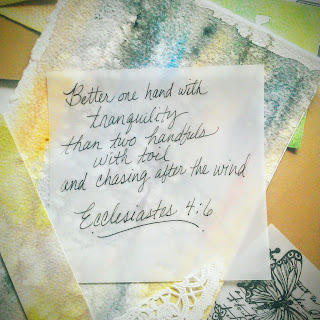 This week, I've chosen a couple of ways to stay active in the art studio while easing up on myself. First, I have been planning my next color mixing chart for upcoming watercolor paintings. As you can see, there's a ways to go yet. I'll get to it in the next few days. Updated photos to come at a later date. Second, playful watercolor for no special reason. Relaxing exploration. Brushes in hand, pigment on the paper and unknown results. Third, laying out potential designs for note cards. Experimenting with different layouts is great fun! I'm looking at options for building some really unique layers with a variety of elements. The pen and ink was a fun diversion. Fourth, Artist's Network TV videos online are a great way to take a break! I just needed to take it easier physically. This is a subscription service but so valuable to me. I was able to watch two videos while putting my feet up! Joyce Faulkner and Guy Magallanes are very entertaining! I learn so much from both of them. They each have their own distinct style and methods. I watched one about painting crabapple blossoms and another about painting poppies. I'll link to the YouTube previews here: Crabapple Blossoms and Icelandic Poppies. Each of these videos were about 100 minutes in length. The videos show the process from beginning to completion. I love seeing techniques and methods in action! Here's a link to Artists Network TV watercolor preview videos available on YouTube. The watercolor videos alone are 242 in total! So, now I'm off to relax and let my back take a time out. 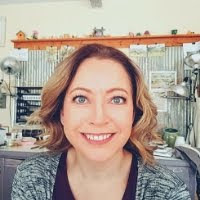 I was torn about whether a blog post is really necessary in light of how I'm feeling BUT I love having this continuity! Do you see yourself pushing at a harder pace to get the results you haven't seen yet? Are you familiar with simplifying and regrouping before going forward? How do you keep it all in perspective? How do you evaluate your goals on a regular basis? What's your go-to way to relax and take a break?